So you've decided that you want to transition to a vegan lifestyle. Awesome. But where do you start and what is useful to know. Alot of the things I feel are helpful are in the videos to the right! If they do not answer your questions feel free to contact me at berty_justice@hotmail.co.uk or on facebook. 1. There is a vegan source for every nutrient humans need. 2. 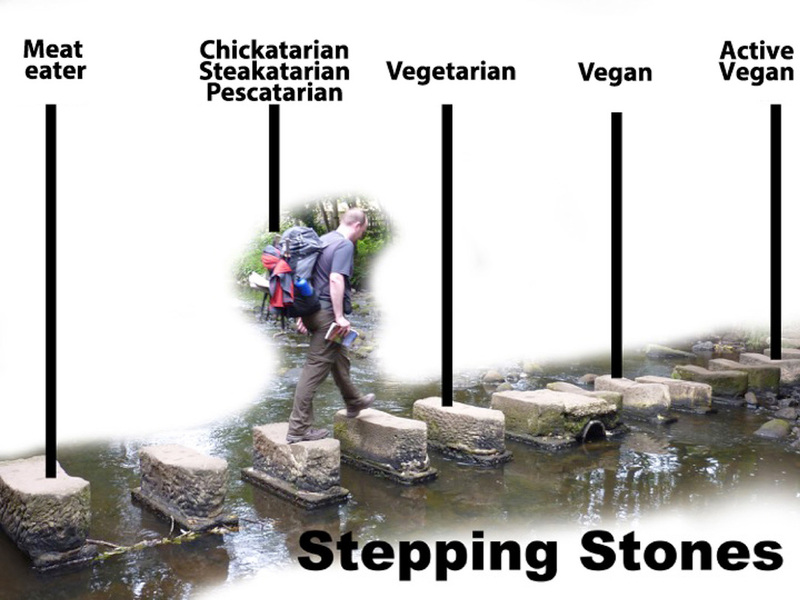 Using stepping stones is an easy and effective way to transition (scroll down to the image at the bottom). 3. If you have cravings they do go away. 4. There is a vegan version for most meat and dairy products. 5. Be confident in asking for veggie options when eating out, also use the happycow.org website for worldwide eating listings. 6. Question traditions and so called norms. Like how its illegal to kill and eat dogs in the UK, but ok to do the same to pigs. Both are thinking and feeling sentient mammals that deserve the right to live. It is culture and tradition that have shaped how we view them differently.